After today, you can officially start counting down to Friday. Yay! That means you're THAT much closer to letting your flighty side take over (and we know that's really your FAVORITE side). You've been a serious Susie for the last two days, and it's killing you. Take a flight of fancy dedicated to your freer side in some heels like these May peep toes by Roger Vivier (available at MyTheresa.com). (Feathers are VERY in fashion this season, and they're on EVERYTHING!) 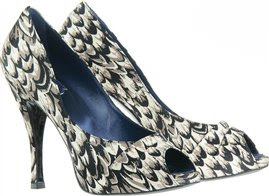 These plume-printed satin pretties on a 4.5 inch heels say you appreciate the simple things but enjoy exciting twists. Oh, let's not forget how they also work with the black and white trend that's so in this year, too. Since your mind is in the clouds today, you should let a Vanilla Cloud (recipe and image courtesy of amountainofcrushedice.com) take your taste buds there too. It's a creamy-looking combination of Beefeater gin, fresh lime juice, vanilla bean syrup and a little bitter lemon soda. 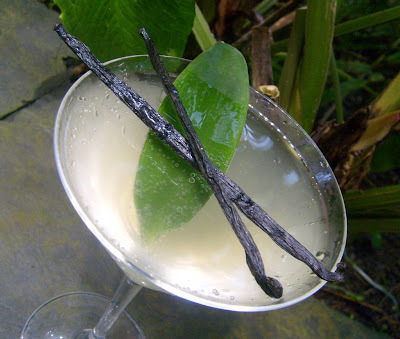 (Most bars won't have the vanilla syrup for which the recipe calls, but it should still work with a vanilla liqueur.) The flavor is smooth, but it's still strong enough to "lift" you. That said, mind your intake. We wouldn't want you flitting off into some dangerous situation.